You don't need carpentry skills to erect The CAPRI, because it requires no wood structure for mounting the canopy tracks. The Capri deck canopy comes complete with a rugged aluminum support system made of the same heavy-gauge aluminum material as the tracks. 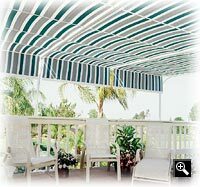 Available in a soft-white or taupe color, its powder-coated finish complements any of the many available canopy fabrics and will provide years of service. 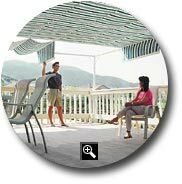 Like all ShadeTree® systems, The Capri is custom- made to fit your deck or patio. All parts are pre-cut and pre-drilled. Assembly is quick and easy ­ the base fittings attach to your deck, patio or railing. The overhead tracks mount to the house or overhang. Aluminum tracks in the Capri model can span up to 21 feet from the house. Just add additional canopies to achieve desired width using 60" or 46"